"Creamy corn empanadas are an Argentinean classic. These can be made open like a tart or closed like a pasty - the choice is yours! You can opt to make the pasty-like version; find the method in the footnote." Preheat oven to 400 degrees F (200 degrees C). Grease and flour a 12-cup muffin tin. Line the muffin cups with the 12 pastry rounds. Heat 2 tablespoons butter in a skillet over medium heat; cook and stir green onions until tender, 3 to 5 minutes. Add corn, salt, pepper, and nutmeg; cook and stir until heated through, about 2 minutes. Remove skillet from heat. Heat 3 tablespoons butter in a saucepan over medium heat; add flour and cook, stirring with a wooden spoon, until a paste forms, about 1 minute. Slowly pour in milk, whisking constantly, and cook until a thick sauce forms and starts to bubble, 2 to 3 minutes. Add half of the Parmesan cheese and stir until smooth; remove from heat. Stir sauce into corn mixture. Fill pastry with corn mixture and top each with remaining Parmesan cheese. 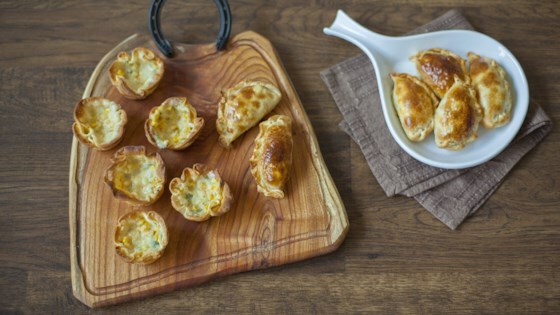 Watch how to make classic Argentinean corn empanadas! To make pasty-like 'closed' empanadas, spoon one big dollop of the sweet corn mixture in the center of the empanada pastry round. Fold the dough over in half to enclose the filling. Use a fork to press and seal the edges. Brush with beaten egg and bake at 400 degrees F (200 degrees C) until golden. Delicious! I made the filling as written. I rolled out empanada rounds, cut them into fourths and put them into mini muffin tins. Perfect! I think it would also be delicious with phyllo cups.